Game Fishing Lures | Components and Tools | Swivels (Ball Bearing) Original or S.P. 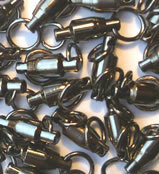 Pack of 3 Spintec 'Original' Ball Bearing Swivels. Ultimate performance. Over the years Spintec supplied many thousands of George's 'Original Ball Bearing Swivels', until he decided to take his well-earned retirement! We obtained supplies from the new manufacturer however it soon became apparent they weren't made to same specification and quality as George's! They didn't spin well and bent very easily. Spintec decided to reverse engineer George's classics, manufacturing in house to the same quality to guarantee the same performance. Made the traditional way by hand in Ribchester, we're so confident you'll be happy with Spintec's 'Original Ball Bearing Swivel', we offer a full no quibble money back guarantee! Use with small for lures up to 10g. Approx. 15mm long. Superb performance and value. Finished with two welded rings which pivot. Precision manufactured ball bearing swivels which prevent line twist and allow maximum fishing time as you're not wasting time untangling line! Use with medium lures from 10g to 25g. Approx. 18mm long. For use with larger lures from 15g to 34g. Approx. 19mm long.